Chenya Sun (right), a consultant with a Beijing agency called Nuts, evaluated the needs of Wanyi Zheng, a student at Tsinghua University who is seeking to apply for PhD programs at US schools. 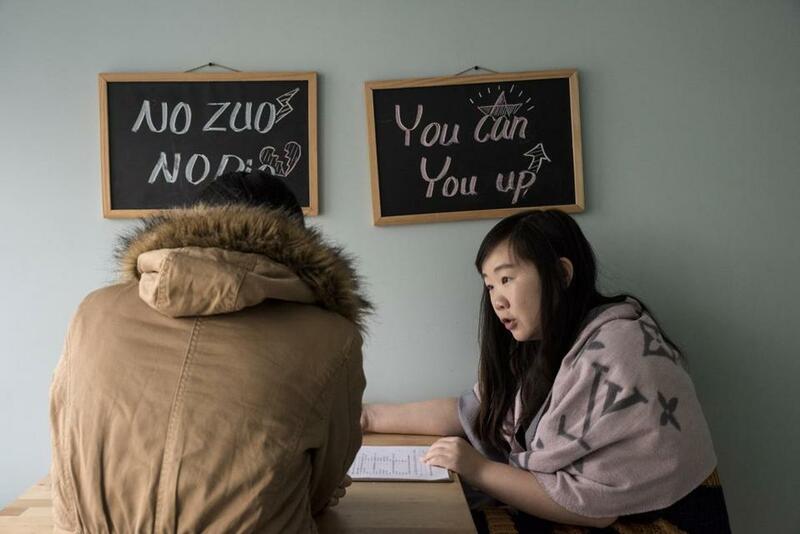 BEIJING — A video camera and two plastic chairs sit in a tiny room on the city’s west side, the latest weapons in a global battle against the wave of admissions fraud striking US schools. College-bound Chinese students come here to InitialView, one of several such companies operating in the country, to film a video interview and prove their speaking abilities match their applications. As a record number of Chinese students stream into American universities, verification companies like this one have sprouted up to help combat doctored transcripts, falsified essays, and surrogate test-takers. They vie against another set of Chinese companies, which turn out false applications and seek to profit off the frenzy for a US degree. The issue has intensified as China’s expanding middle class has sought prestige through American colleges — with Boston a prime destination — and schools seek to capitalize on full-paying foreign students to bolster budgets. It ripples through US campuses, where professors complain unqualified students slow down classes and hard-working Chinese students feel stigmatized. Inundated admissions officers are taking measures to catch fraud, but with millions of dollars at stake, few schools are attempting the overhauls needed to make a sizable difference. Students from all over the world, including America, have fudged essays, hired advisers, or found themselves in trouble for looking at another student’s answers. But, as the largest group of foreign students in the United States, the Chinese stand out. More than 300,000 Chinese students studied at American colleges last school year, according to the Institute of International Education, a nearly 11 percent increase from the year before. 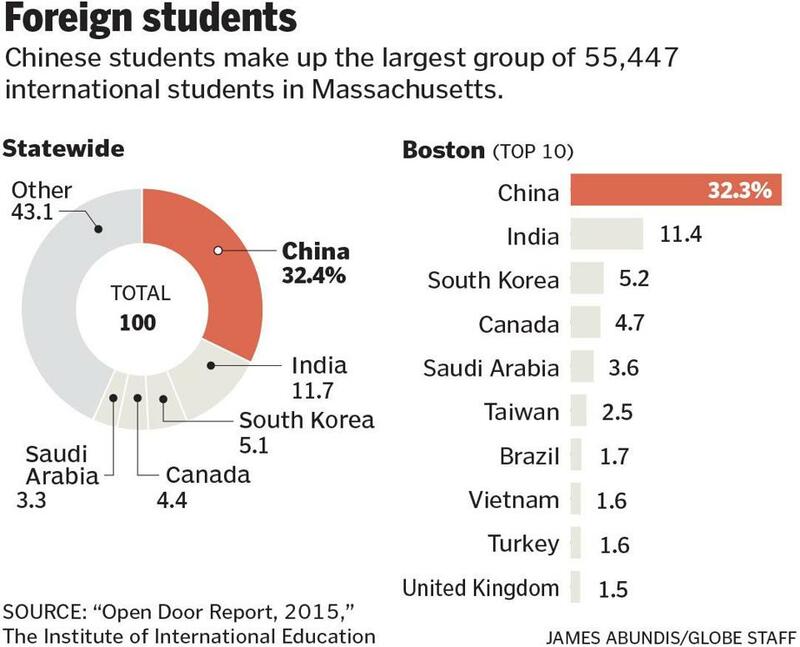 Among the 55,000 foreign college students in Massachusetts, a third are Chinese. Justice Department officials in May charged 15 Chinese, including a Northeastern University student, in a testing scheme in which some students paid others as much as $6,000 each to take their SAT and English proficiency tests. Students in China ordered fake passports and sent them to co-conspirators in Pennsylvania, who took their exams. The College Board, which administers the SAT, delayed numerous scores from four of the seven times the test was administered in Asia in the past year while they investigated cheating suspicions. The College Board, as well as the company that administers the English proficiency test, take various measures to curb fraud, such as keeping SAT booklets in locked boxes until test day, when codes are texted to test administrators. Cheating “has been going on for a while,” said Stacy Caldwell, the College Board vice president for college readiness assessments. “Certainly as we’ve continued to rapidly grow our international business, the number of issues that we’ve seen internationally has certainly grown along with that. “We do our absolute best to run down any cases of [fraud] that we find,” Caldwell added. Students attending Chinese colleges face expulsion and even jail time for cheating on their country’s rigorous entrance exam, known as the gaokao. No such rules exist for tests to study abroad. The result shows up in the classroom, where some students struggle to understand or bend the rules to pass classes. More than 8,000 Chinese students were expelled from US universities in 2014, according to a report by WholeRen Education, a Pittsburgh-based education consultancy. Around 80 percent of the cases involved poor grades or cheating. Admissions fraud takes many forms, from faking a recommendation to paying more than $10,000 for someone to complete an entire application. Schools, especially in college-heavy Boston, admit they struggle to tell the difference. Simons, like many admissions officers, can recite a slew of suspicious application stories. She recently looked over an essay a student wrote about his girlfriend and noticed the cadence sounded odd. When she plugged a passage into Google, she discovered the paragraph was a translated Korean pop song. That student didn’t receive an acceptance letter. Other admissions officers at colleges in Boston tell similar tales — of applicants who stumble through an e-mail but submit a flawless essay, of a student who wrote about his passion for computer science but applied to study biology. In another instance, according to a verification agency called Vericant,an admissions officer couldn’t figure out why a black cat sat on a Chinese girl’s lap through their Skype interview. A nervous habit? Then it became clear. It was no cat but the student’s mother, lying on her lap whispering the answers. One of the world’s largest education pipelines into Boston is located in a high-rise neighborhood on the west side of Beijing, wedged between China’s top universities and a throng of tech startups. Towering buildings house agencies that play the middlemen between schools and students. While all the companies aim to profit off their endeavors, many simply want to help applicants understand the befuddling US admissions process. Others exploit students’ desperation and veer into fraud. Agencies charge fromseveral hundred dollars to tens of thousands, with payment often tied to their success rate. About 500 agencies are licensed in China, but thousands more operate in a gray area of legitimacy. The gleaming offices of New Oriental are here, the largest and most well-known of the third-party education companies. Former employees and students said agents at the company often write entire essays for students. New Oriental contends it maintains the highest standards for both the company and its clients. The agency “stands for nothing less so that it can consistently and effectively have a positive influence on education overall,” said spokeswoman Cara O’Brien. Others, through different agencies, also experienced disappointing outcomes. 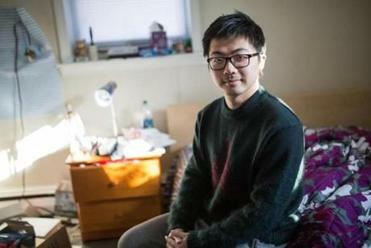 Lei Zao, a 23-year-old from Beijing, said he paid an agent nearly $5,000 two years ago to apply to 10 US universities for graduate school. The agent told him not to worry about taking the graduate school exam or filling out applications. He realized too late that the agent had applied to only six universities, all of which rejected him for not taking the required test. The agent’s essay barely looked like English. “I used an agent to do the job for me and I regret it now,” said Lei, who lost a year applying to schools and is now completing a masters at Southern Methodist University in Dallas. The company shut down its Beijing branch and refunded part of Lei’s money. That agency, Bincailiuxue, based in the northeast city of Harbin, declined to comment. It is those types ofsketchy applications that colleges, and this new breed of verification companies, hope to stop. Wellesley College and the University of Massachusetts Amherst recommend that students do video interviews with InitialView, which charges students $220 for an interview and writing sample. A video interview, the company argues, can help distinguish applications. InitialView’s cofounder, Gloria Chyou, and her husband started their Beijing business in 2009 after he struggled to find Chinese assistants for his law practice who matched their resumes. They pivoted to higher education in 2011, although Chyou said they had to convince colleges then they should consider a verification component to their application process. More than 200 schools now accept InitialView’s interviews and about 70 actively recommend them. Vericant, a Beijing-based company that conducts videotaped interviews, saw a similar need for fraud prevention and recently expanded its operations to include universities such as Smith College, Boston University, and Brandeis University. Schools pay $1,500 for a membership, and student fees start at $300 for a package with an English-speaking evaluation. Vericant interviewed 2,000 students last year and expects to double that this year. Simmons College uses an outside company to examine Chinese transcripts. At Worcester Polytechnic Institute, where the SAT is optional for all applicants, admissions staff put less weight on test scores of students from China because they know they are heavily coached. Last year WPI rescinded the application of one student who admitted to hiring someone to take his SAT. 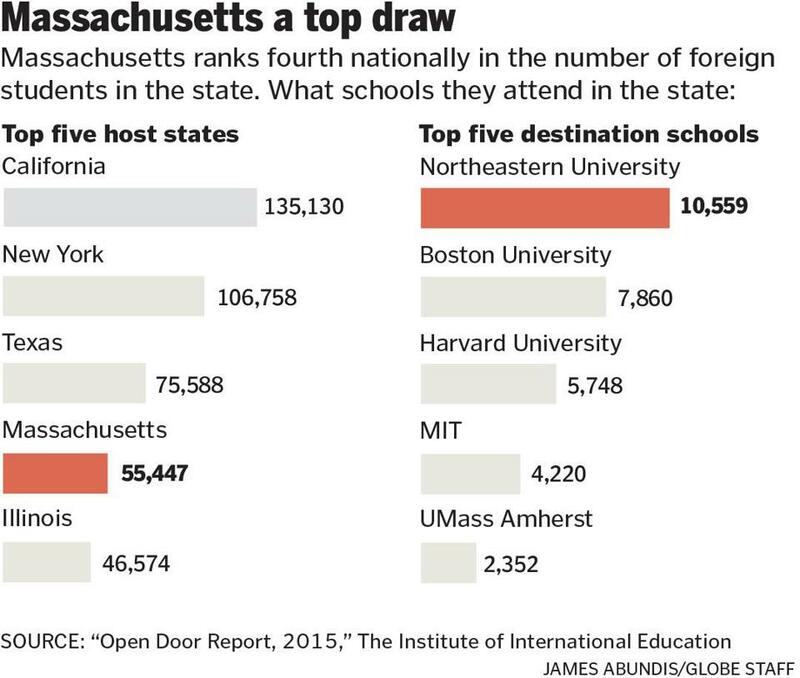 Northeastern University, the top Boston destination for international students, also does not require the SAT for overseas applicants and makes annual trips to China to focus on high schools where it has developed relationships. Still, Boston admissions officers said they detected fraud primarily by reading hundreds of applications. “I’ve read a lot of files and I think sometimes you just sort of feel,” said Anne Corriveau, who leads international admissions at Boston University. Much of the motivation for cheating stems from a US application process at odds with China’s education system. Chinese students can find it difficult to obtain recommendations from teachers who might not speak English and have classes of up to 60 students. Mainland China does not offer SAT testing centers, so students must travel hours to Hong Kong. They scramble for limited seats on the English proficiency test, known as the Test of English as a Foreign Language. Extracurriculars — which admissions officers admire in their quest for well-rounded students — are rare in a society that prioritizes studying. Nigel Xiao came to Boston University from Jiangsu province. Before he started college, Xiao received a text from a person who wanted to hire him to take someone else’s English proficiency test. “It seems that they know your test score and then they can find you,” he said. He ignored the request. Another Chinese student accepted the offer to ghostwrite college essays. She interacted with an agent online and never knew for whom she wrote. The gig paid about $30 for a 500-word admissions essay, which she used for pocket money. But many honest Chinese students suffer the consequences of others’ fraud. Su Liwei, a high school senior who speaks impeccable English, made the nearly four-hour flight from Beijing to Hong Kong in November to take the SAT. Like many 17-year-olds, he waited anxiously for the results — only to discover test administrators were not making scores public until they investigated suspected fraud. He lost the chance to apply early decision. “It really killed me because they thought someone was cheating, so they delayed all of us,” he said. The Chinese government recognizes that some students and agents game the admissions process, said Jon Santangelo, spokesman for the Beijing Overseas Study Service Association, a government-affiliated agency created to help standardize the country’s growing number of education agencies. The group has launched an authentication center that helps verify transcripts from Chinese schools and an online education course that certifies education agents. But the responsibility to stem fraud, Santangelo said, largely rests with American schools. Educators concede real change will require a systemic shift in how schools focus on international applicants. Australia is considering a government-funded project that would require applications from foreign students to list the names of agents. The US State Department now offers global advising centers that can help schools single out legitimate education agencies. Su Liwei, the high school student, sat in a Beijing mall on a windy afternoon and scrolled through cellphone photos of the SAT study materials that took over his desk. Three floors up, students piled into another education agency. On the door of the first study room, a Harvard University sign beckoned. 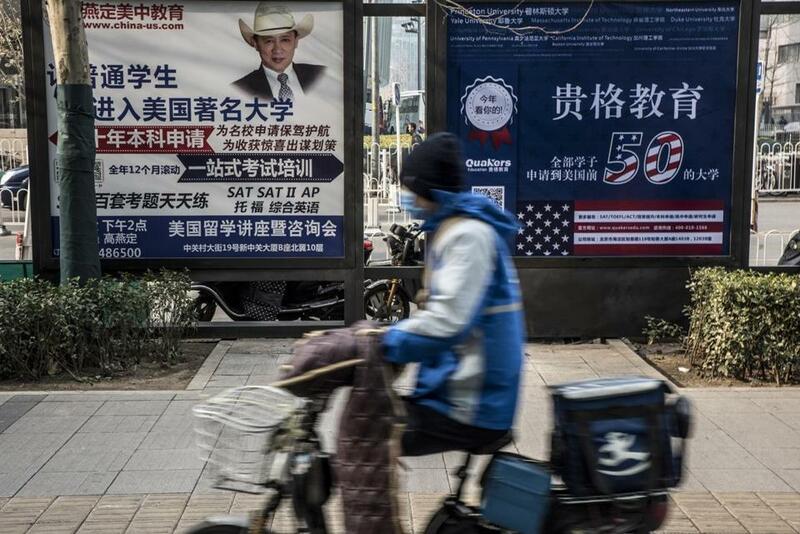 Billboards promoting companies that help students with their applications for US universities were visible last month in Beijing. Laura Krantz can be reached at laura.krantz@globe.com. Follow her on Twitter @laurakrantz. Contact Jessica Meyers at jessica.meyers@globe.com. Follow her on Twitter @jessicameyers.